Mayor Michael Bloomberg's successor will bring change to New York City, and some of it is likely to warm an Islamist's heart. Consider the NYPD's post-9/11 intelligence-gathering operations inside the Muslim community. Bloomberg and Police Commissioner Ray Kelly have defended these counterterrorism tactics against years of criticism; long-shot Republican candidate Joe Lhota also supports them. However, Democratic frontrunner Bill de Blasio has pledged to replace Kelly and clearly seeks to curb the NYPD, telling Muslims that "the efforts of surveillance have to be based on specifically specific information." Recapping the Islamist terror plots thwarted by the NYPD, writer Daniel Greenfield explains that "the standard of 'specifically specific information' would have led to the deaths of countless New Yorkers." He adds: "They relied on informants drawing out potential terrorists, instead of waiting blindly for them to strike. If Bill de Blasio has his way, that will no longer be something that the NYPD will be able to do." The sole silver lining is that any resulting tragedy will prompt the swift repudiation of such kinder, gentler counterterrorism — at least until forgetfulness triumphs once more. By a nearly two-to-one margin, voters in the Swiss canton of Ticino approved a constitutional ban on the wearing of face-concealing attire in public. Though the text does not explicitly mention Islamic dress, its driving force, campaigner Giorgio Ghiringhelli, described his goal as "put[ting] a stop to the inevitable spread of niqabs and burqas." The September 22 referendum marked the first time that any of the 26 cantons has backed a prohibition. Previous legislative attempts failed in cantonal parliaments as well as the federal parliament in Bern, which now must decide whether to accept the change to Ticino's constitution. Little may be done until the European Court of Human Rights rules on challenges to French restrictions on face coverings. With its unique instruments of direct democracy, Switzerland is a particularly promising arena for foes of the burqa and niqab. A 2009 nationwide referendum outlawing the construction of new minarets showed that the Swiss are willing to act against overt signs of Islamization when offered the chance. Expect to see more referenda targeting the veil there. 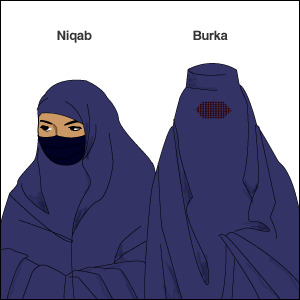 Also note that Switzerland is not the only European country witnessing efforts to ban the burqa on sub-national levels. Multiple Spanish towns have enacted laws, but the Supreme Court recently gave them the thumbs down. Currently there is a renewed push to bar the face veil in Spain's Catalonia region. Left: A niqab-wearing opponent of the Ticino referendum. Right: "We have to stick with the way we eat and what we do in Denmark," Prime Minister Helle Thorning-Schmidt declared. "There should be room for frikadeller [meatballs]." Muslims comprise 4.1 percent (2010 estimate) of Denmark's population, but accommodating their dietary requirements increasingly means making the other 95.9 percent eat like Muslims. Based on a survey by Ekstra Bladet, dozens of Danish daycare centers and nurseries no longer serve pork, and some use only halal meat slaughtered according to Islamic ritual. Moreover, it has been revealed that all beef fed to patients at Hvidovre Hospital near Copenhagen is halal. In further halal news from the summer, a social appeals panel ruled that giving pork to Muslim foster kids violates their rights, and traces of pork in supposedly halal kebabs led to an assault. "We need to remember in our zeal to welcome new citizens not to lose sight of our own culture," said Prime Minister Helle Thorning-Schmidt, explaining her opposition to dropping traditional pork dishes from menus due to hypersensitivity. She also urged the voluntary labeling of halal meat. It was reported years ago that "a vast majority of all Danish slaughter chickens — 99 percent — are butchered using the halal method." Is it any wonder why a third of non-Muslim Danes now believe that Denmark has gone overboard in its demonstrations of "tolerance"?